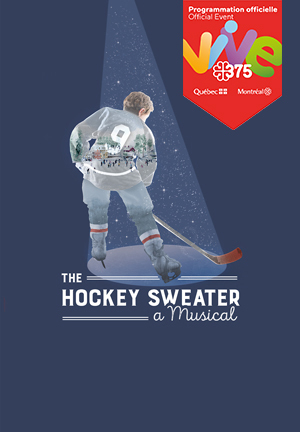 The Hockey Sweater: A Musical that will Warm your Heart! 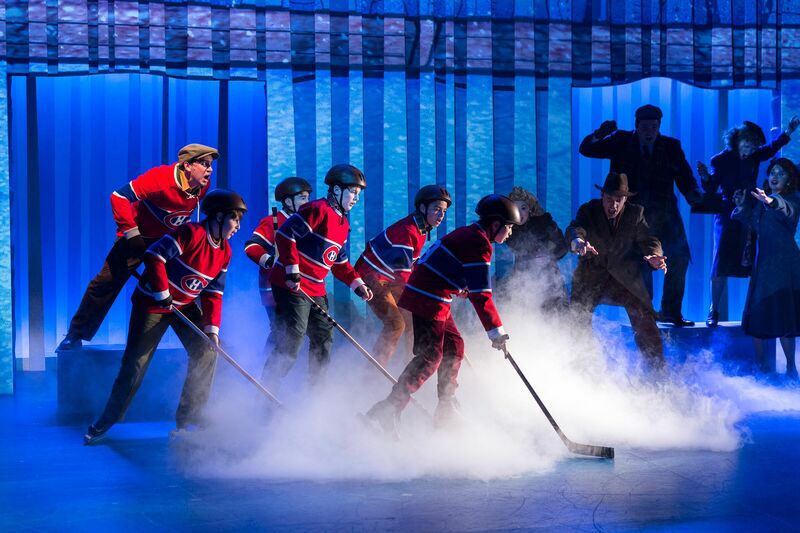 What better way to celebrate Montreal’s 375th anniversary than with a funny and heart-warming musical about hockey? The Segal Centre commissioned and produced this original musical based on the famed short story by Roch Carrier. 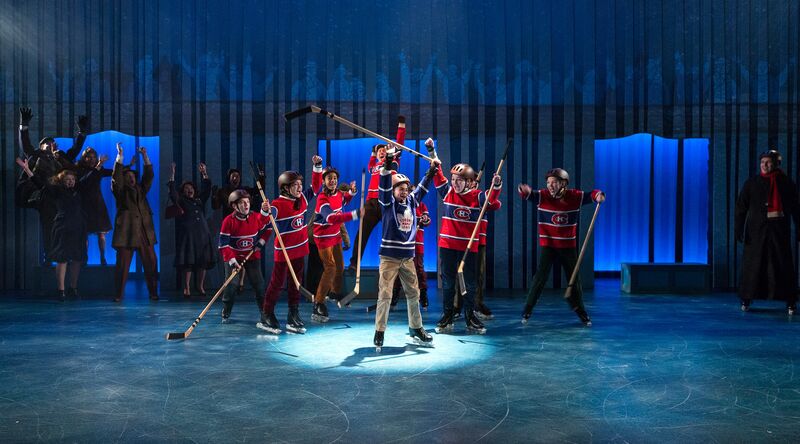 Directed and choreographed by Donna Feore, whose recent Guys and Dolls production wowed audiences at the Stratford Festival; The Hockey Sweater is a must see for anyone who has ever had a dream. 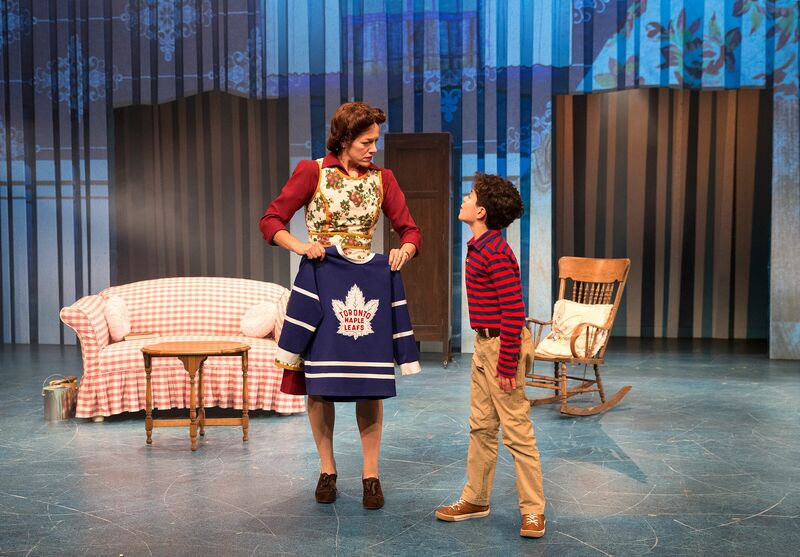 The play opens with snowflakes falling on the silhouette of a small town. You are immediately pulled into this nostalgic scene, reminiscent of a Charlie Brown Christmas or the Nutcracker. 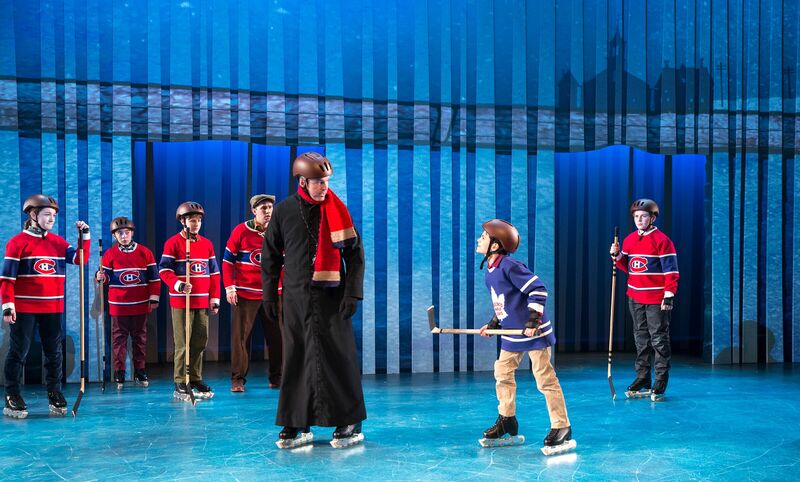 The charming set was inspired by Sheldon Cohen’s illustrations for The Hockey Sweater’s children’s book and brought to life by Designer Michael Gianfrancesco and Montreal’s video and scenography specialists Normal whose client’s include Cirque De Soleil. The main character Roch is a grandfather now and as he watches his granddaughter run off to the rink, he begins to remember his own childhood. It’s 1946 and his Canadian’s jersey is falling apart so his mother orders him a new one for 3$. In a mailorder mix-up, Eaton’s sends him a Toronto Maple Leaf’s jersey instead. You can imagine Roch’s dismay! How can he play the big game on Sunday when he isn’t wearing the right colors? 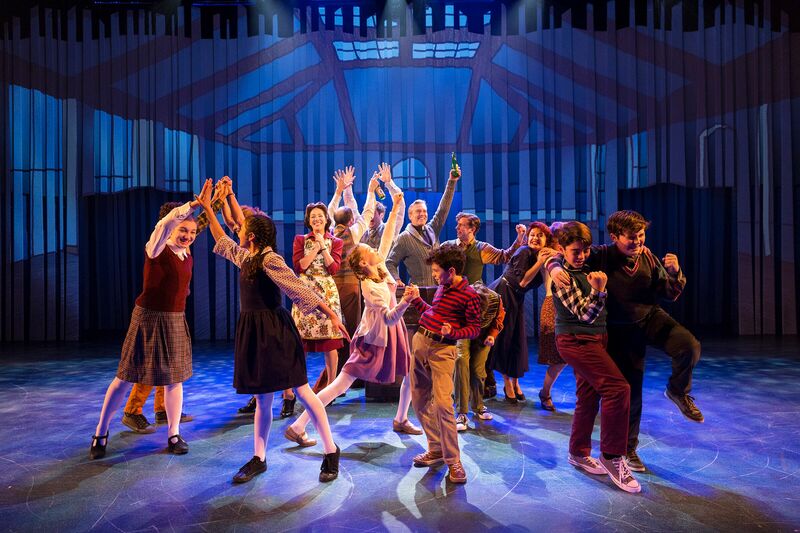 How do you turn a short story into two-hour musical? If they stuck to the story, it would be 10 minutes long according to lyricist Emil Sher. You have to flush out the characters and create a community. Roch’s fellow Rocket Richard worshipping teammates, their parents, coach, teacher, and the town priest are played by Canada’s top talent, half of which are kids. If you have any children in your life, you are familiar with Nickelodeon’s Paw Patrol. Marshal the main dog is given a voice by the tall team captain played by 14-year-old Drew Davis. Seeing him dance made me so happy! Roch is the smallest of the group and played by the adorable and impressive Jesse Noah Gruman who has been dancing since he was 5. As director Donna Feore says, a child actor can be “cute for about 10 minutes and then its not going to work anymore.” These kids are so passionate and focused, and have been training like athletes for weeks. Their energy and dance moves will make you smile. I wish I could have simultaneously shaken their hand for their professionalism, and given them a cuddle for their cuteness. It’s too much! Playing the long-suffering but earnest mom is not always easy to pull off in an interesting way, but Claire Lautier does it. The combination of her authentic depth and the universal lyrics questioning if she’s doing a good enough job as a parent made “Is it me?” one of my favorite solos. We can’t forget the red-headed and saucy teacher Madame Therrien played by Kate Blackburn. Her melodramatic antics had the crowd in stiches. I won’t reveal my favorite dance number, but I can tell you that the chorus surprised me with some of the silliest and most fun moves I’ve seen. I really can’t reveal more because I don’t want to take away from your experience. I will only tell you that you will relate. You will laugh. You might even leave with a tear in your eye. What better way to kick off the holiday season than with a heart-warming story about what everyone wants; to shine in your own unique way, doing what you love most, surrounded by love, and a community that sticks together. It’s a simple idea, but one we can all relate to, whether we love hockey or not.